A patent is a set of rights guaranteeing an inventor the exclusive right to develop their own invention for a limited period of time. Well, that's what they're supposed to be. Instead, patents are corporate nuclear weapons. A loose coalition of community organizers, peace activists, and supporting organizations have called on volunteers to join them October 6, 2011, for an “occupation” of Freedom Plaza in Washington D.C. 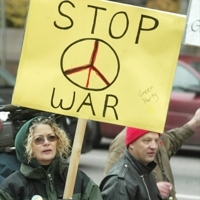 Some anti-war protestors from 2007. The sixth Iowa Straw Poll took place Saturday at the Hilton Coliseum located on the campus of Iowa State University in Ames, Iowa. The Straw Poll, created in 1979 by the Iowan Republican Party, is held every Fall before highly disputed caucus elections, and serves as a strong indicator to a Republican candidate’s strength. 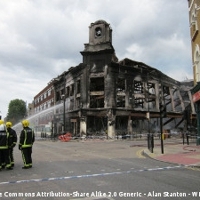 The death of 29 year-old Mark Duggan in the Tottenham borough of London domino-ed into almost a week of widespread rioting, looting, and arson in London and several other cities from August 6th until August 10th. Iowa City Owl is looking for writers and photographers for both our local and world news sections. Interested individuals should email news AT iowacityowl DOT com, specifying what they are most interested in writing about.